Turn your Instant Pot to the saute setting. While it’s heating up pat your chicken dry with some paper towels. When it says HOT on the display add in 1 Tbsp of olive oil. Place each piece of chicken into the bottom of the pot. Let the chicken sit there and brown for 5 minutes. Using tongs turn the chicken over and brown for 5 minutes on the other side. Carefully remove the chicken and place it on a plate. Add in the minced garlic and saute for 30 seconds. Add in the chicken broth and deglaze the pot. Add the chicken back into the pot and lightly salt and pepper it. Add the onions, then the carrots and finally the potatoes. Don’t stir. Sprinkle the kosher salt, black pepper, oregano and lemon pepper over the vegetables. Drizzle the other 1 Tbsp of olive oil over the top. Drizzle the lemon juice over the top. Cover and pot and secure the lid. Make sure valve is set to sealing. Set the manual/pressure cook button to 4 minutes (less soft vegetables) or 5 minutes (softer vegetables) on high pressure. Let the pressure release naturally for 10 minutes and then move the valve to venting. Remove the lid. Stir the pot a little to distribute juices and seasonings. 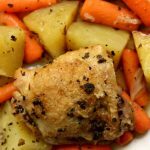 I haven’t tried it but I believe you could use boneless chicken for this recipe as well.